Is Windows 8 for July 2011? Is Microsoft looking to close the gaps between major OS updates? A posting on an MSDN blog may shed some serious light on Microsoft’s upcoming release schedule. According to Chris Green, a developer who recently finished working for Microsoft, Windows 8 mainstream support is targeted for 07/01/2011 which is the first date that we have seen regarding the release of Microsoft’s next OS. 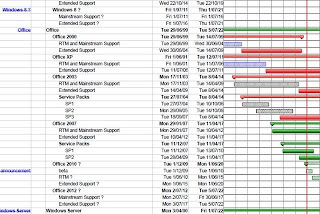 Other dates of interest are for Office 2012 which shows a targeted date 7/2/2012. While there is a lot of speculation involved with the release dates mentioned, some of the dates are correct for previous launches. The chart stipulates Office 2010 for a June release and we know that this has already been confirmed by Microsoft. The dates, as always, should be taken with a grain of salt. But, the depth and detail of the chart is impressive and should give us a rough estimate of Microsoft’s upcoming plans. The full chart is posted below, (warning: PDF).